Sorry, there was a problem with the previous posting of this announcement. This one is correct. MCLC and MCLC Resource Center are pleased to announce publication of Li Guo’s review of Animation in China: History, Aesthetics, Media (Routledge 2016), by Sean Macdonald. The review appears below and at its online home: http://u.osu.edu/mclc/book-reviews/li-guo/. My thanks to Jason McGrath, MCLC media studies book review editor, for ushering the review to publication. In the introduction to his ground-breaking monograph Animation in China: History, Aesthetics, Media, Sean Macdonald describes his approach as an examination of “a quasi-official corpus produced during a key period of PRC film and cultural history, from the 1950s to the 1980s” and conducting “a reading of the historically mainstream animation produced at the Shanghai Animation Film Studio (or SAFS)” (2). Prior to Macdonald’s book, Rolf Giesen’s study Chinese Animation, A History and Filmography, 1922-2012 had provided a chronological overview of China’s animation industry and works. Macdonald deepens our understanding of the national narrative of animation in the People’s Republic of China by shifting focus to the specific processes through which China’s state interventions in animation production can be problematized and historicized. To explicate the contexts for the “official, canonical, national history of China’s animation,” Macdonald begins with the story of SAFS, tracing its connections back to film production in the Sino-Japanese War period. The book re-contextualizes the national history of animation within transnational animation history while simultaneously reflecting on animation itself as “a nation-building industry” (2). Chapter 1, “It All Started with a Monkey,” begins with discussion of the pioneering animator Wan Laiming 万籁鸣 and the animation figure Sun Wukong. Macdonald first examines Wan’s important autobiography Sun Wukong and I (我与孙悟空), which connects “film, art, and animation in one historic narrative of modern China” (16) and depicts the rise of animation in Republican China and the PRC. Macdonald offers insightful discussions of Wan’s early background in pictorials and political cartoons as well as of the cross-genre references to opera found in Wan’s animated Uproar in Heaven (大闹天宫). The chapter teases out the nuances and inconsistencies in the animator’s reflections and argues that the animated Sun Wukong is a powerful figure who comes to represent a period of historical transition; Wan’s Uproar erases the mythological legacy of Sun Wukong and recasts him as one “of historical actuality set against a negative, historical past represented by the novel” (23). To rehistoricize the Maoist reading of Sun Wukong as a figure of the masses, Macdonald draws from archival materials to suggests the possibility that Mao Zedong himself identified with Sun Wukong (27).In the introduction to his ground-breaking monograph Animation in China: History, Aesthetics, Media, Sean Macdonald describes his approach as an examination of “a quasi-official corpus produced during a key period of PRC film and cultural history, from the 1950s to the 1980s” and conducting “a reading of the historically mainstream animation produced at the Shanghai Animation Film Studio (or SAFS)” (2). Prior to Macdonald’s book, Rolf Giesen’s study Chinese Animation, A History and Filmography, 1922-2012 had provided a chronological overview of China’s animation industry and works. 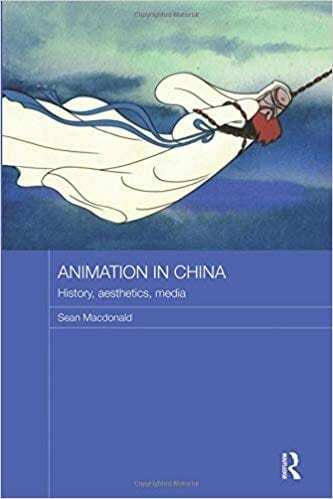 Macdonald deepens our understanding of the national narrative of animation in the People’s Republic of China by shifting focus to the specific processes through which China’s state interventions in animation production can be problematized and historicized. To explicate the contexts for the “official, canonical, national history of China’s animation,” Macdonald begins with the story of SAFS, tracing its connections back to film production in the Sino-Japanese War period. The book re-contextualizes the national history of animation within transnational animation history while simultaneously reflecting on animation itself as “a nation-building industry” (2). According to Macdonald, an understanding of the SAFS-animated Sun Wukong requires an examination of the historical conditions of the film’s production and of the limitations and fallibility of some aspects of the director’s self-reflections. Whereas Wan endeavored to legitimize animation as an art form, his approaches construct a poetics of animation and a “very selective reading of revolutionary history” (33). The core argument of the chapter is that “the story of Wan Laiming and Sun Wukong is one history of animation as a mode of representation and a mode of production, as a medium that reproduces types of representation and at the same time represents a mode of production” (29). The potential to replicate himself endlessly allows Sun Wukong to serve as a symbol of collectivity, which in state rationalization evokes correspondences with the productive labor forces underlying the realization of socialist modernity. The chapter also examines Sun Wukong as a figure of the masses through a discussion of Zhang Guangyu’s 张光宇 earlier paintings Cartoon Journey to the West (exhibited in 1945). Macdonald makes a crosscultural comparison of Wan’s Sun Wukong as a SAFS studio logo and cultural icon with Andy Warhol’s iconographic representations of popular culture as high art (37). Similar crosscultural readings include a discussion of what Sergei Eisenstein called “plasmatics” in the nature of Sun Wukong and an examination of Sun Wukong’s similarities to the Fleisher brothers’ works in displaying grotesque movement and surreal transformations. The Sun Wukong of the Uproar in Heaven invites audiences to consider the “coincidental links and intersections” that can take place in the minds of spectators and readers (42). Chapter 2, “Cartoons and Chinese Studies,” offers a multidimensional theoretical historicization of animation in China. “Katong” (卡通), which is the early Chinese transliteration for cartoon, represents a “foreign, non-Chinese medium of representation” (48). Macdonald probes into earlier literary discussions of this term by Mu Shiying 穆时英 and Zhang Ailing 张爱玲. He credits Zhang for her observation that “the cartoon was a bracketed form, inserted between other shorts and newsreels and often preceding the main feature” (49). The chapter revisits John K. Fairbank’s discussions of PRC and Chinese studies in the USA. Fairbanks’s observations, for Macdonald, are slightly generalizing because of his inclusion of “Chinese studies within the discipline of history in the United States” (51). Macdonald suggests that an Orientalist and Eurocentric position is also very limited, in that such a vision prescribes the “Orient” to “a place of despotic political systems outside of history” (56). Modern philological studies in the nineteenth century revealed that “Western scholarship on China borrowed, translated and even mimicked Chinese commentaries on philosophy and literature” (57). Edward Said’s Orientalism illustrated the construction of the Orient as a cultural other “through comparative textual interactions of two or more cultures” (54), but Macdonald argues that Said’s failure to include popular and social science narratives suggests “the limits of literary reading in an era of emergent mass media” (58). In the second part of the chapter, Macdonald discusses the historic shift from Sinology to area studies and how the social and political relationship between the US and the PRC shaped US-based area studies. In this regard, he mentions two works of literary criticism, C. T. Hsia’s A History of Modern Chinese Fiction 1917-1957 (1961) and Rey Chow’s Woman and Chinese Modernity (1991). Both Hsia and Chow, in Macdonald’s view, construct “counter-discourses” to oppose the limited, reductionist stance of official PRC literary and cultural historiography. Macdonald engages another pair of critics in Chinese film studies, Wolfram Eberhard and Jay Leyda. Eberhard’s work on popular and genre cinema, Macdonald argues, is visionary and of great importance, because attention to such fields is still relatively scarce and needs to be boosted (63). Leyda’s approach connects discussions of film studios to the framework of a national cinema (63). Macdonald persuasively states that the field of film studies focused on China is situated as both part of area studies and a developing sub-discipline of international film and media studies. Animation in China likewise displays an in-between characteristic, connecting the story of SAFS to the “prehistory” of China’s animation around WWII, and the larger chronicle of the rise of American area studies. Chapter 3, “Meishu pian as a National Style,” analyzes the relation between “race” and minzu, and how minzu as a term and concept arose in cultural and critical discourses in the PRC. The chapter offers an extensive review of film directors’ and critics’ reflections on the definition of the Chinese national style, drawing from Weihua Wu, Paola Voci, Zhang Songlin, Chris Berry, and Yingjin Zhang. Citing Yingjin Zhang’s criticism of the important film Liu Sanjie (刘三姐), Macdonald argues that its “objectification of the ‘other’ through ethnic markers implies the potential objectification of Han Chinese culture as a set of tropes and characteristics, of features and markers that signal ‘Chineseness’” (83). This relational interpretation of minzu or ethnic identity effectively reconfigures ethnicity and national identity beyond their specific contexts. Macdonald also examines an article by SAFS director and animator Te Wei 特伟, who seeks to legitimize the use of fantasy in animation in response to the political environment in 1960. Te Wei’s promotion of fantasy links the industry to animation discourses about state and nation in the pre-PRC period and fashions a theoretical continuity between animation discourses before and after 1949. These discussions provide in-depth delineations of the national style in China’s animation in multiple cultural and historical contexts. Macdonald argues that “the story of funding SAFS is an example of a historical-origin narrative that positions the studio within national style debates of the 1950s and 1960s.” The narrative of SAFS serves as “an example of national style discourse, an early example of film identified as national cinema, and an example of auteurproduction” (89). The chapter provides in-depth and penetrating analysis of a range of seminal animation works produced in the 1950s and 1960s. The animation short Why Is the Crow Black? (乌鸦为什么是黑的? ), which has been mistaken as a Soviet film, illustrates that “national style is a series of lost and found referents; of lost and thus reiterated discrete details; references to classic literature, folk-tales, folk art, operatic melodies, a wide array of potential citations, of virtual referents” (91). The Arrogant General (骄傲的将军) borrows conscientiously in characterization, movement, image, sound, and music design from traditional operatic conventions and gave animation a “Chinese” face for its transnational audience, ironically embodying a form of nationalist “conceit” and showing that “national style is a transnational trope of identity projected onto new mediums of cultural production during the revolutionary period” (91). The ink-brush animations Where is Mama? (小蝌蚪找妈妈) and The Oxherds’ Flute (牧笛) represent successful attempts to transform brushstroke techniques to “the mass-produced medium of painted animation cels” to achieve visual and auditory effects (99). Chapter 4, “A Discussion and a Princess,” begins with a review of an article “Discussion of Animated Film” (座谈美术电影), published in Film Art (电影艺术) in 1960. This article introduces readers to a conference about animation by eighteen participants, including six writers, a filmmaker and playwright, nine artists, a composer, and the animator Wan Guchan 万古蟾. Macdonald suggests that this discussion indicates how animation was perceived in the PRC at the time by cultural producers in areas largely outside of film and animation. At the conference, Wan Guchan made an important distinction between cel and cutout animations and observed the potential for cutout animations to avoid the labor in producing cel animations, an observation that resembles Thomas Lamarre’s discussion of the difference “between drawing movement and moving drawings in [Japanese] anime” based on his readings of Japanese anime, including Tezuka Osamu’s Astro Boy in 1963 (107). Wan’s cutout animation, for Macdonald, transcends traditional puppetry and reflects the fact that animation has been transformed into a modern institutionalized art form and a nationalist historical form. The chapter highlights the animation Princess Peacock (孔雀公主), which lends itself nicely to discussion of issues of ethnicity and national identity that resonate with themes in chapter 3. The film draws attention to stop-motion animation’s techniques of “using motionlessness to convey emotion” and making non-animated and still figurines of the characters deliver “voice” and sing melodies (120). The chapter offers a thought-provoking discussion on the formation of alliances through the royal marriage that underlies the film’s plot. Arranging for a princess to marry a foreign prince has historically been a diplomatic, political, or even military stratagem for a nation to solidify peace, disseminate culture, or execute espionage activities. Although the representations of Princess Peacock and her family members are symptomatic of mass media imaginations of racial (and gendered) others in the PRC, this exoticization ironically provides space for the film to distance itself from the revolutionary and reductive ideological narratives that characterize other animation works of this period, within the scope and in the name of advocating a national style. This potential for film producers to utilize folk materials of ethnic “others” within the nationalist discourse to negotiate for more flexible artistic expression suggests that there is still some room for artistic agency in the socialist film world. Macdonald is correct in suggesting that Princess Peacock is very much a figure of “internal orientalism” and articulates the doubly marginalized status of minority women within the nationalist discourse. The chapter ends with a substantial discussion of director Jin Xi’s 靳夕 endeavors to “represent the fantastic and still pay lip service to realism” by citing from the Maoist text “On Contradiction,” appealing for an understanding of the poetics of representation beyond the nationalist discourse (131). What could be added to Macdonald’s readings is that the Princess is not entirely objectified and displays multiple forms of agency. After her marriage into Prince Zhao Shutun’s kingdom, she wins the love of the people because of her beauty and dancing talent. When wrongly accused of being a witch, she eloquently voices her innocence in front of her father-in-law and even moves the queen to tears. When commanded to sacrifice her life for her husband and the nation, she pleads for a chance to perform a farewell dance; when she dons her peacock feather cloak, she flees the danger, displaying her freedom to travel between the earth and the celestial realm. The end of the film shows Prince Zhao Shutun and Princess Peacock sharing a gilded flying carriage and returning to the prince’s kingdom, which illustrates both a reinforced alliance between the couple and the heroine’s increased authority. Her initial marriage to the prince could be considered her first “return” to the kingdom; for women, “marriage” (gui 归, also meaning return) in the pre-modern context implies that a woman’s marriage is a “return” to her husband’s home. The finale shows her second “return”: she was brought back by the future king himself to be the matriarch of the kingdom. Chapter 5, “Nezha naohai (Nezha Conquers the Dragon King): Scar Animation and an Ending,” analyzes Nezha Conquers (哪吒闹海), a seminal film released in 1979 during a transitional period following the end of the Cultural Revolution. Macdonald argues that “with links to scar literature and art, the suicide and reincarnation of the boy-god Nezha moves towards an open-ended and unresolved historic finale” (136). “In the context of cultural production in the PRC,” he writes, “Nezha Conquers represents a birth, death, and rebirth of mythological material” (172). He offers first a meticulous review of the literary origin of the Nezha story—that is, three chapters from Investiture of the Gods(封神演义), a sixteenth-century Chinese vernacular novel. Macdonald wisely draws from P. Steven Sangren’s anthropological reading of the text, showing “linkages between popular literature and religious practices in China” and the potential Oedipal impulse in the narrative (138). Further, Macdonald traces other pre-modern roots of the Nezha figure: to the novel Journey to the West; to ancient and medieval sutras and Chan Buddhist texts; and to Taoist-influenced images from the late medieval and late imperial periods. Wang Shuchen 王树忱, the director of Nezha Conquers, reworks this hybrid historical context to satirize the Gang of Four and emphasizes the story as an allegory of “rescue,” “reawakening,” and “regeneration.” Macdonald also reads Wang’s adaptation of the Nezha myth as an extended allegory of the death and rebirth of the animation film industry in the PRC (139). The plot foregrounds familial relationships, but the conflict between father and son is given the focus and the mother’s image is rather effaced. Also, another mythical character, Master Taiyi, is introduced. He congratulates Li Jing, Nezha’s father, for the boy’s birth and gives the baby the name Nezha. Macdonald argues that the patrilineal implications of the myth are reinforced in the SAFS adaptation. Whereas the boy-god is depicted as both “an agent of the disasters and as the hero who must put an end to them,” this double-sided character and his animosity have been granted legitimacy “within a political, nationalistic framework” (150). Macdonald traces depictions of the hero and the villain back to earlier revolutionary films and animations, arguing that in such films, both hero and villain are “part of the simulacrum of the conflict” (150). The ambiguity of Nezha’s character speaks to this historical context and the film’s complex representations of collectivities as revolutionary simulacra. Considering the film’s unique position “at a historical juncture for cultural production in the PRC” (167), one can perceive the animation as an attempt to heal the “scar” of the Cultural Revolution. The transitory figure of Nezha manifests a cinematic departure from the revolutionary hero as protagonist (172). Chapter 6, “Industry and Animation,” offers a valuable and timely study of animation and contemporary mass media in China. Macdonald incisively observes that by the 1980s, animation was an established media industry that was a fundamental aspect of people’s everyday lives, appearing to them in the form of vintage animation works, as animation in television series, advertising, and contemporary paintings. The popularization of animation via multiple media forms goes hand in hand with the process of commercialization of film production and distribution in the 1990s. Macdonald rightly observes that such cultural changes reflect a new mainstream view of commercialization as one way of achieving individual freedom and political autonomy (182). “The simulacrum of historical shift,” he writes, “is an aspect of the China-centric ride from a generalized revolutionary culture, a periodic designation, into a capitalist mode during the contemporary period” (183). Animation is both a media industry and a medium of cultural production and reproduction. Contemporary research on animation in the PRC could be considered as falling into two intertwined streams: one economic, the other historical. The economic stream of research, Macdonald argues, considers animation under the neologism dongman, including donghua or cel animation, and manhua, “the Japanese loan word for print cartoons, comic books and manga” and treats animation and related industries as various forms of “technological-cultural innovation” (185). The chapter compares and builds connections between the cultural politics of SAFS animation productions and animation works of twenty-first century China. It offers much-needed discussions on recent and less-studied animation works—including The Dreaming Girl (梦里人; 2005), The Boonie Bears (熊出没; 2012), and Miss Puff (泡芙小姐; 2012)—and their reconfigurations of the “real,” the “animated,” and human intimacy in the digital age. Macdonald alludes to critics Weihua Wu (2014) and Paola Voci (2010) in discussing the importance of Flash animation for independent production. In drawing from Voci’s characterization of “lightness” in new media, Macdonald suggests that her postmodern readings of Te Wei’s Where is Mama? and Ah Da’s 阿达 36 Characters (三十六个字) as examples of “light animation” point to animation’s potential to surpass the grand narratives of socialist propaganda, nationalist discourse, or traditional culture. Independent animation works in twenty-first century China provide new ways of perceiving the materiality of the animation medium by considering the labor involved, materials and costs, and tracing its historical continuity with earlier fine arts films. Published in 2016, Animation in China is one of the first book-length, theoretically-informed analyses in English to focus on animation in the PRC. The book makes an excellent contribution to current scholarship by situating Chinese animation vis-à-vis the American and Japanese animation traditions, modern and contemporary cultural production, and pre-revolutionary and traditional folk histories, as well as referring to critical discourses in Sinology, area studies, film studies, media studies, and popular cultural studies. Whereas the case studies cover seminal animation works laid out according to a historical sequence, the structure of the book also reflects an organic and thoughtful theoretical framework that highlights the author’s intention to historicize animation in China in multilinear ways. Macdonald appears to be well-read in film criticism, media studies, Sinology, area studies, and postmodern criticism. His analysis not only seeks to review and re-interpret historical records and resources, but also to build on and expand mainstream views through re-contextualization. Whereas the individual chapters and analytical language are theoretically driven, the titles of the chapters are well crafted to provoke the readers’ interest through iconic figures in the history of Chinese animation. Macdonald is a marvelous storyteller, and his prose is vibrant, fluent, and often humorous. The case studies of key scenes and leading characters tease out intriguing and nuanced implications and provide convincing evidence. The book shows the author’s remarkable capacity for close reading and intense frame-by-frame analysis of film and media materials and draws on his strong command of theoretical discourses to generate interesting comparative interpretations. Macdonald positions himself between concrete film analyses and interdisciplinary debates about animation, media, and cultural production. He strategically cites literary texts, newspapers and magazines, and other written media materials to provide historical contexts for the film and animation works. In inspecting folklore animation works produced by SAFS, he makes conscientious linkages and connections with pre-modern and pre-revolutionary materials, whether it be traditional mythology, popular religious beliefs, or canonical literary works. This well-rounded self-positioning, in return, allows the author a critical posture beyond binary conceptions of modern and pre-modern, revolutionary and pre-revolutionary, and enhances the book’s appeal to an interdisciplinary audience. The book’s theoretical rigor, analytical maturity, and lucid writing style make it a must-read for scholars of film and media, as well as for students of East Asian popular culture. It will also serve as a much-needed reference book for graduate seminars and advanced undergraduate courses on the above topics. What could have complemented the book’s attractive structure is a brief conclusion or epilogue revisiting the arguments of the chapters and delineating directions for future study. Shortly after publication of this book, a two-part special issue on animating Chinese cinemas, including eight research articles, was published in the Journal of Chinese Cinemas. Macdonald’s book foreshadowed these essays by pointing toward exciting directions of research in animation studies, as well as animation, media, and technological-cultural innovation. Macdonald himself also contributed an essay on the celebrated SAFS animator and film critic Jin Xi in Part I of the aforementioned special issue that is expanded from chapter 4 of his book. In light of engaging theoretical dialogue with recent animation studies outside the field of China studies, there are some related publications that could be briefly mentioned or cited as secondary sources. One is Karen Beckman’s important edited volume Animating Film Theory, which provides exciting and up-to-date research on animation and history, cinema and animation, and film as experiment in animation, as well as animation theory in world cinema. Another is Annabelle Honees Roe’s monograph Animated Documentary, which could be employed in a comparative study of contemporary independent animation documentary in the PRC, an important topic for further study. Several publications on Chinese animation appeared after Macdonald’s pioneering book. John A. Lent and Xu Ying’s co-authored book Comic Art in China, for example, traces the evolution of Chinese comic art, the development of cartoon art, and the historical linkages of comic art to other artistic and literary professions in modern and contemporary China. Rolf Giesen and Anna Khan co-authored Acting and Character Animation: The Art of Animated Films, Acting and Visualizing, which provides a valuable study of the importance of actors and personalities adapted into animation, and the techniques of such adaptations as described by the animator, writers, and actors in various animation works around the world. Whereas these recent publications have each taken on unique thematic foci of their own, Macdonald’s book foreshadows various related discussions on multiple fronts and proves to be a visionary work in the study of animation in China and beyond. Rolf Giesen, Chinese Animation, A History and Filmography, 1922-2012 (Jefferson: McFarland, 2014). See Li Guo and Jinying Li, eds., “Special Issue: Animating Chinese Cinemas,” Journal of Chinese Cinemas 11, 2 (2017) and 11, 3 (2017). See Sean Macdonald, “Jin Xi: Master of Puppet Animation,” Journal of Chinese Cinemas 11, 2 (2017): 159-174. Karen Beckman, ed., Animating Film Theory (Durham: Duke University Press, 2014). Annabelle Honees Roe, Animated Documentary (New York: Palgrave, 2013). John A. Lent and Xu Ying, Comic Art in China (Jackson: University Press of Mississippi, 2017). Rolf Giesen and Anna Khan, Acting and Character Animation: The Art of Animated Films, Acting and Visualizing(Boca Raton, FL: Taylor and Francis, 2018). Posted in Film, MCLC, Media	Bookmark the permalink.